Based on Communication, Inspired by Compassion. We speak dog! Through our knowledge of how dogs view the world and why they do the things they do, we aim to reach across the interspecies divide with love and understanding. 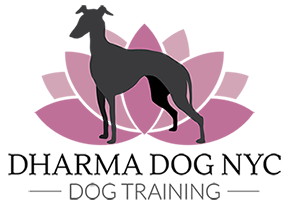 Our goal is to help you establish a form of communication that builds trust between you and your dog. You will have fun while you both learn! Dharma Dog NYC is committed to using ethical and force-free training methods. Based in positive reinforcement, our techniques are scientifically proven. We are constantly learning the most current techniques that advance us in non-invasive behavioral work. We do not use dominance, force, fear or pain in our training. We find most of our clients are relieved that they can change their dog’s behavior while remaining a kind guardian to the animal they love. We can help you! Quality of life is important. Reach out to us.